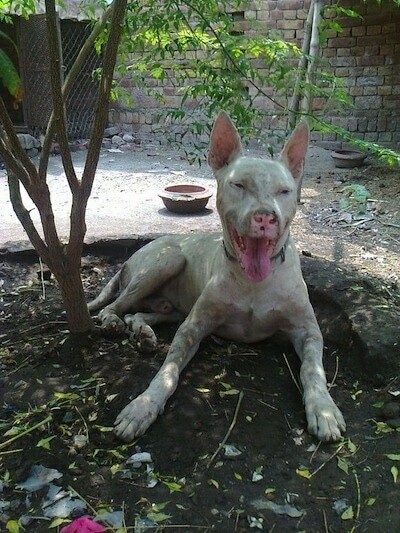 "This is one of the purest Pakistani Gull Terriers. 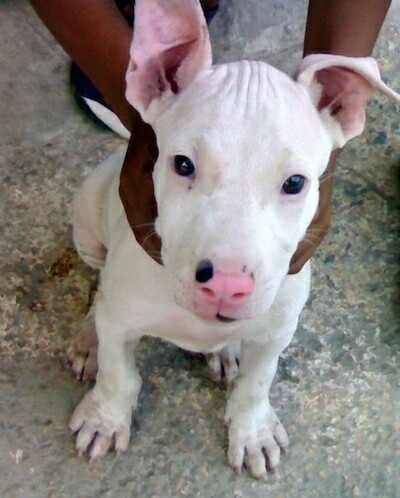 You can see that his ears are erect and his color is pure white. 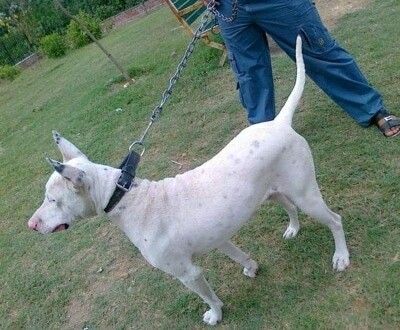 This dog is owned by Malik Naveed Hassan from Chakwal, Punjab, Pakistan." 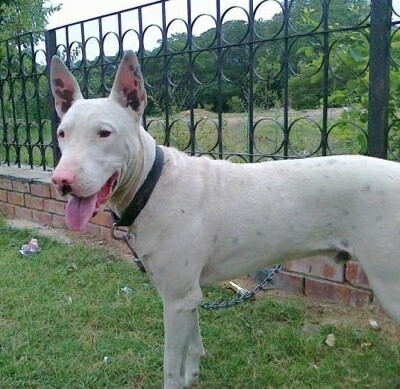 There are three main types of Pakistani Bull Terriers (Gull Terrs) differentiated by size and use. 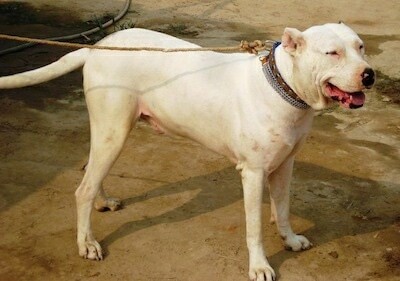 PGT can have erect ears, also known as Kohati Gull Terr, semi erect ears and dropped ears. 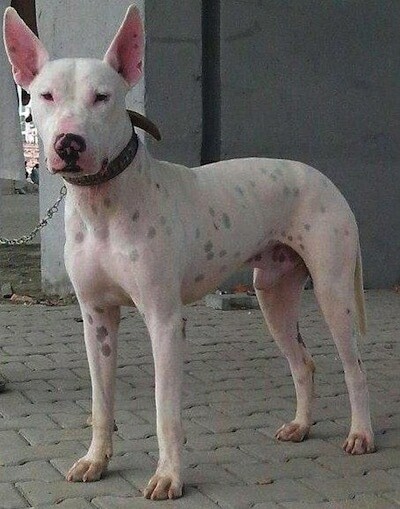 Pakistani Bull Terriers are tall, broad-chested, medium-size molosser type dogs that are largely found in Pakistan. 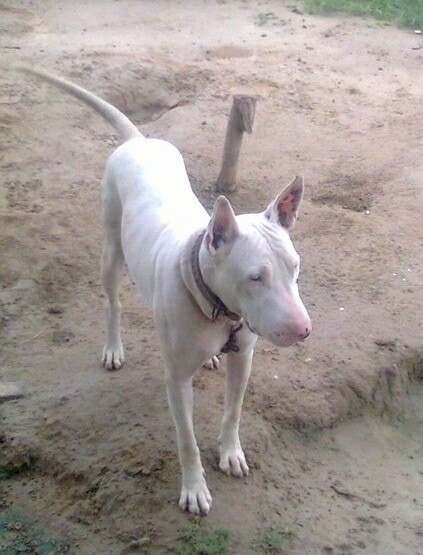 The purest Pakistani Bull Terriers always have erect ears, but dropped and semi-erect ears are also found. 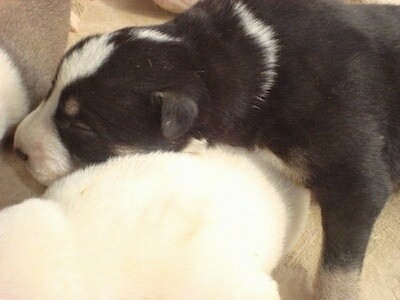 Their coats are usually white, however some may have dark colored markings on the face, but it's rare. The coat is smooth and short. 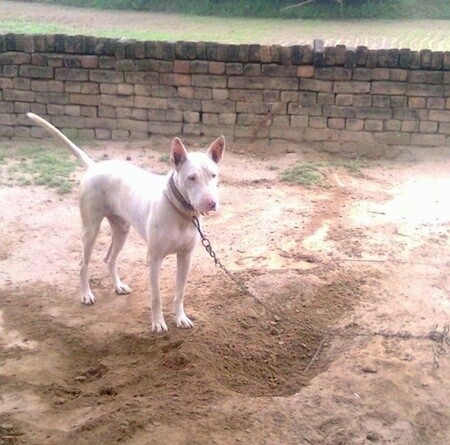 Pakistani Bull Terriers are often wary of strangers. They are very protective of their master and property. 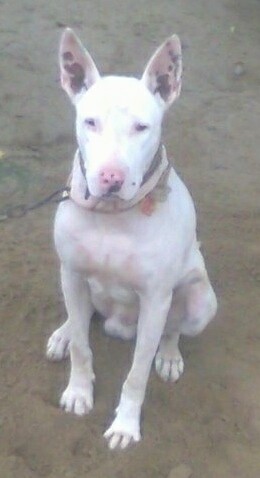 Talented and easily trained, they are gladiators and if pushed they will defend their family till their last breath. 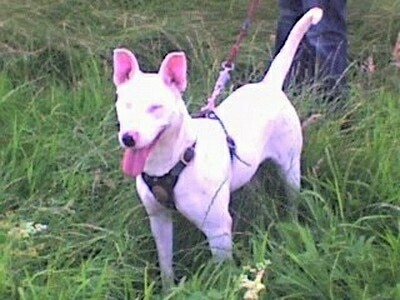 Good with kids in the family, but should be supervised around those they do not know. 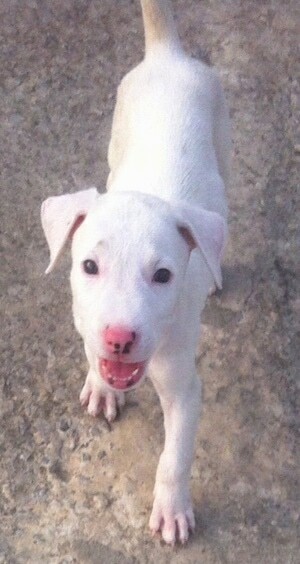 Socialize this breed from an early age to make them easier to handle when they are grown. 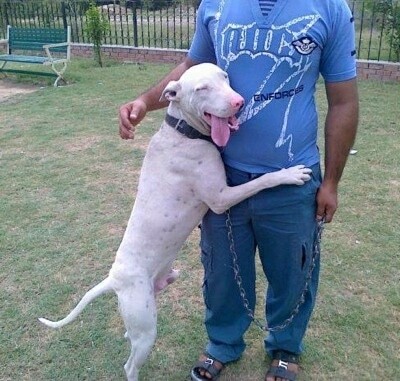 They should not be trusted with other non-canine pets. 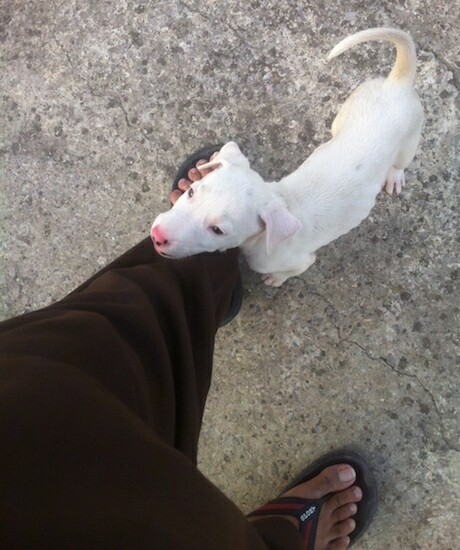 Loyal, the Pakistani Bull Terrier likes to stay close to its master. 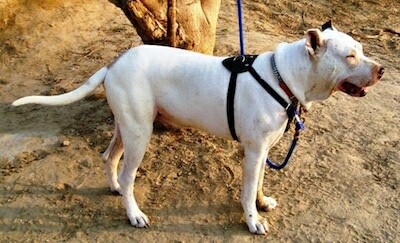 If it senses something is wrong it will bark first to alert the owners. 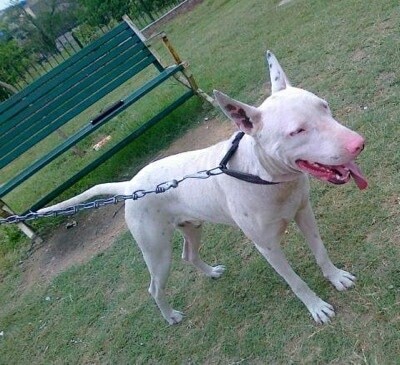 With adequate training and discipline, these dogs can be used as ideal guard dogs. 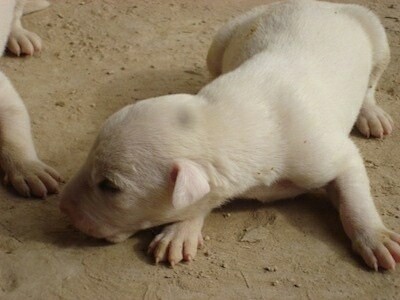 The Pakistani Bull Terrier is widely popular for its fast speed and accuracy. 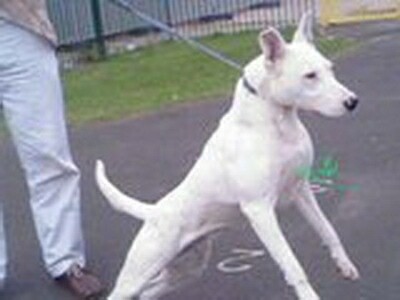 These dogs are agile, quick and always on their feet. 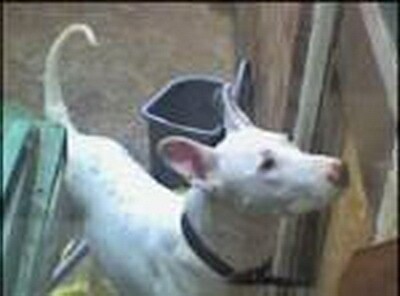 They are excellent personal guard dogs. 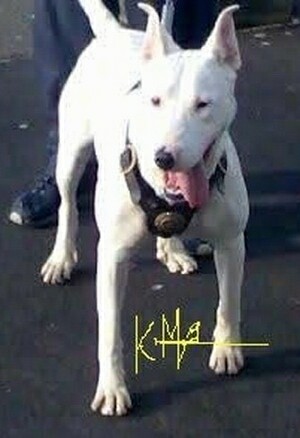 This breed thrives on firm, consistent leadership. They need very firm training and lots of exercise. 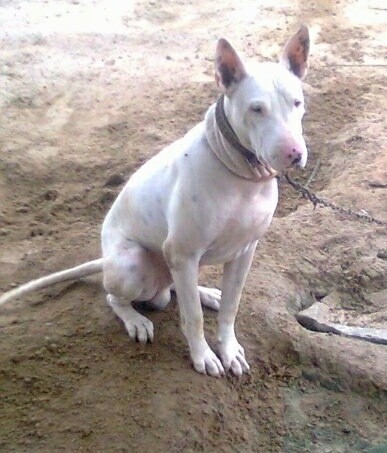 Pakistani Bull Terriers must be given a lot of structure, or they may become destructive. 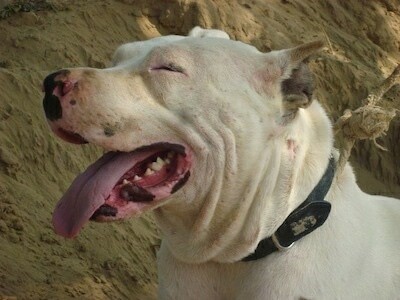 Be sure to remain their pack leader 100% of the time, otherwise they can be extremely aggressive with other dogs. 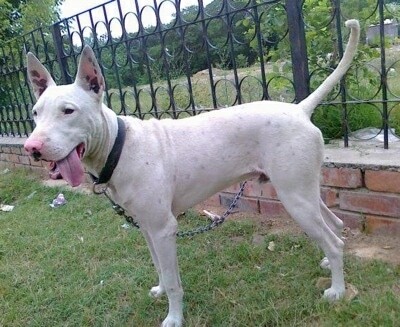 Height and weight depend on the type of Pakistani Bull Terrier (Gull Terr). 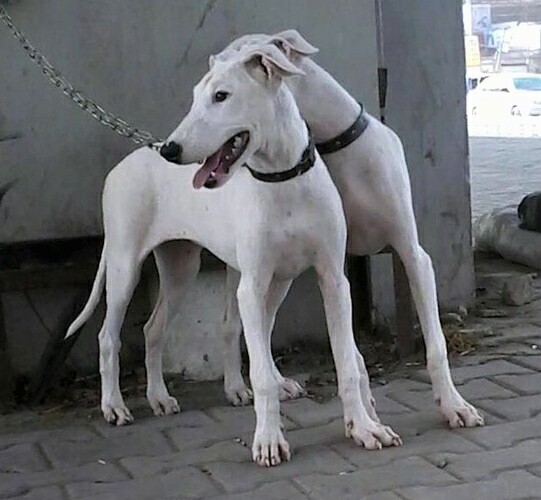 Usually they are 20 - 26 inches (50 - 66 cm) tall and weigh around 77 - 99 pounds (35 - 45 kg). Not suitable for an apartment unless you keep the dog extremely well exercised. 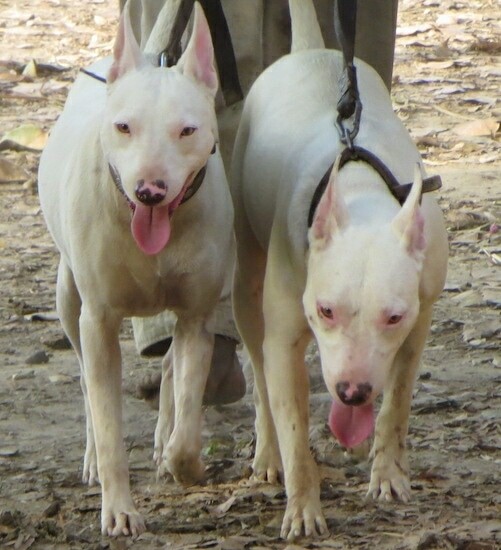 Very energetic breed; it requires daily exercise, which should include a long, daily pack walk. 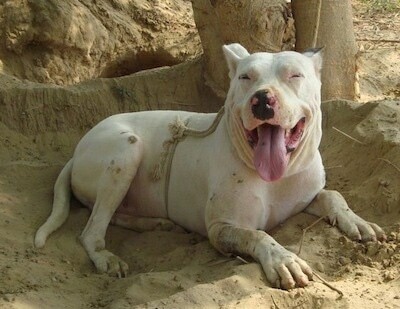 The Pakistani Bull Terriers (Gull Terrs) are cousins with the English Bull Terriers. 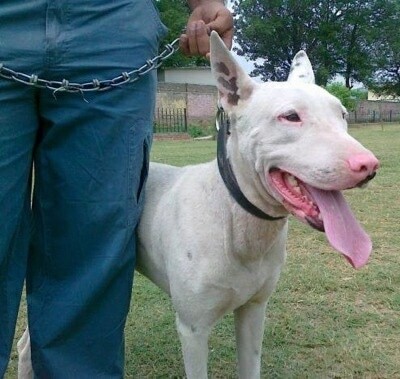 When the sub-continent was under British rule, the British army brought their pure English Bull Terriers with them. 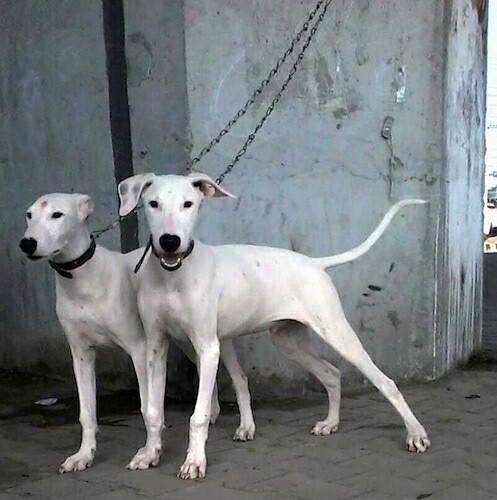 These dogs were crossed with local breeds to produce the Pakistani Bull Terrier (Gull Terr). 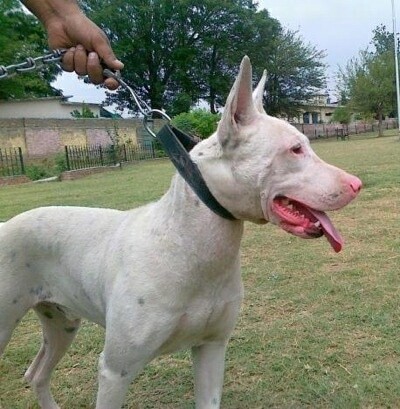 Not very common in other parts of the world, the Pakistani Bull Terriers have been used for bear baiting and dog fighting in Pakistan, however these types of games are illegal, so nowadays people mostly use the breed as a guard dog. 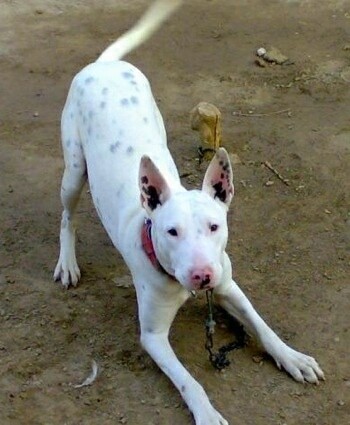 The Pakistani Bull Terrier (Gull Terr) was one of the breeds used to create the Gull-Dongs (Pakistani Bull Dogs). 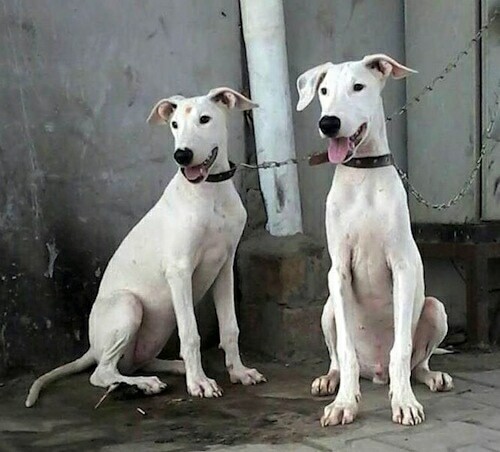 Raja and Rani the Pakistani Bull Terriers as 4 month old puppies from Peshawar, KPK, Pakistan. 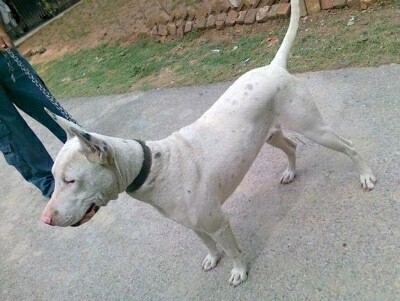 They are Katha Gull Terr (Semi Dropped Ear) types. 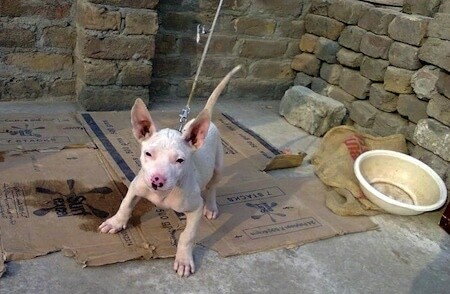 Braco the Pakistani Bull Terrier as a puppy at 6 weeks old from Pakistan—"He is very intelligent and mature for his age"
"This puppy's name is Scoopy. 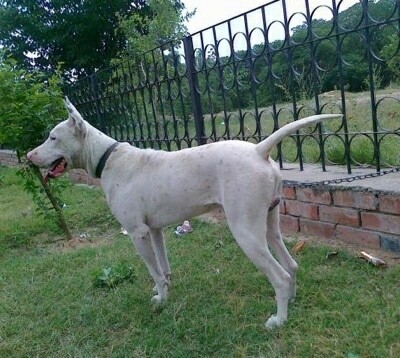 It is an excellent example of a Pakistani Bull Terrier with semi erect ears. 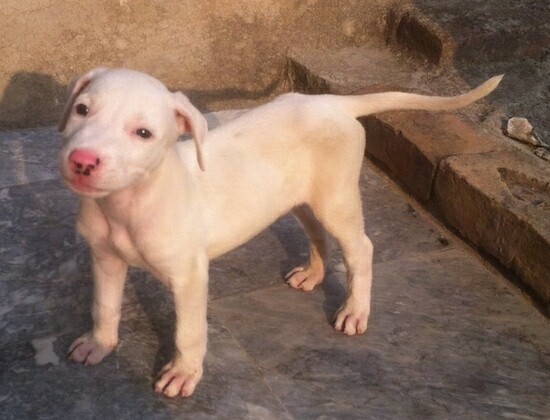 This puppy is in Lahore, Punjab, Pakistan." 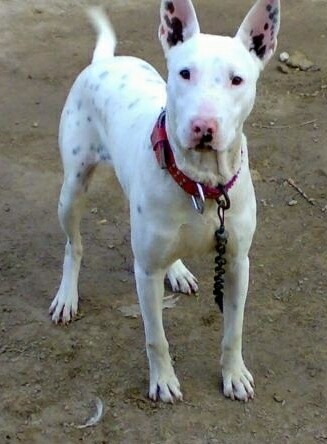 Pakistani Bull Terrier (Gull Terrier)female—the mother of the puppies, owned by: Naseer Bhatti. 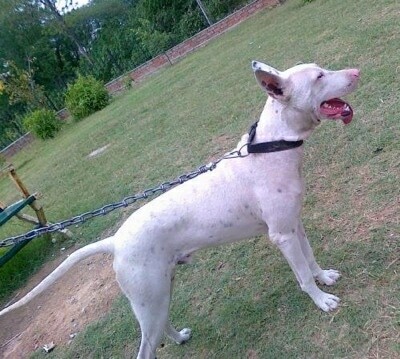 Purebred Pakistani Gull Terrier (Pakistani Bull Terrier) owned by: Malik Naveed Hassan from: Chakwal, Punjab, Pakistan. 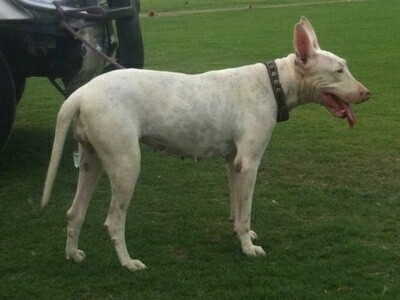 Moothi the female Gull Terr (Pakistani Bull Terrier), owned by Kalile (from the U.K.), was imported from Pakistan. She is 24 inches tall from the ground to the top of the shoulders. 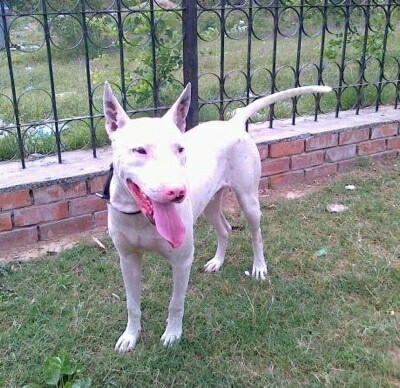 Moothi the female Gull Terr (Pakistani Bull Terrier), owned by Kalile (from U.K.), was imported from Pakistan.